The to-do list to finish the goat barn is gradually growing shorter. Progress is somewhat random, depending on weather and resource availability. The second Dutch door is done. The first one was the front entry to the milking room, this one is to where the goats will live. The windows in the hayloft help a lot for light, but I wanted a light for winter evenings when it gets light so early. The solar light pictured above is a smaller version of the one that's in my current milking room. It has only one brightness setting instead of three, which is fine for the purpose. The light's small solar panel. You can also see the roof flashing in the above photo. That's another project Dan's been working on when it isn't raining. Before we move the goats in we needed to fence the barn entryway. For this we used goat and sheep stock panels, like we did for the hay feeder. They are higher in price than cattle panels, but the openings are smaller to keep baby goats in. That's a necessity! In the milking and feed room I now have a workbench! Shelves will go to the right. Even with good progress the checklist of things to finish still seems endless, There are so many little things on the list, but they all take time! Even so, we are slowly getting closer to goat-moving-in day. Very nice and good attention to details . The smaller squared panels are reminiscent of what we call "high five panels" in California. But yours either are cut or something different. Ours are 6 feet tall, most often used for horses and the last time I purchased some they were $75 a piece in 2014. They are 16 feet long and don't ask why they are called high five since it makes no sense in reference to anything about them. By the way, the comment form wouldn't give me the option of using any other id than my Google acct. It used to let my change over to my Wordpress acct. I have no livestock, but I'd love to have a building and shed like that for a workshop! Susan, Blogger no longer supports OpenID, so it seems everyone has to have a google account or the blog owner has to allow for anonymous comments. I may try that again, although it seemed that last time I allowed for that I got tons of spam. Gorges, the "old" goat barn will soon become just that! Long overdue as poor Dan has had to make do with the carport. He needs a proper workshop. PS on panels . Yes they are pricey as heck but when I got them I had 6 yearlings in a barn with attached field that at the time wasn't physically accessible to the Pyrenees.And it was at the most serious juncture of Geoffrey's illness so it needed to be something I could handle. It seemed logically that because of their height and strength to use (ouch) four of them for the fencing side between barn and field. Cheaper than a potential coyote/cat/whatever attack. The barn is looking great. I do love the way solar has come on leaps and bounds over the last 5 years. The light from the bulbs now is quite impressive. If I was a goat, I would be happy living there! Things are really coming along Leigh, how marvelous. I think the idea of the solar light is such a good one. I love those dutch doors too! So well done you two! Super cute, super functional, and the craftsmanship is fantastic. I'll bet you can't wait to be working in there! Goatldi, good point about coyotes and cats. Coyotes can easily jump the standard 50" panels, so the horse panels would be better for that. Mine are 16-feet long as well, and welded, I think 6-gauge wire. Very sturdy and serviceable. Nancy, very true! We never stop adding to it! Tania, I so agree about solar. I love these little lights and think it would be good to keep a few on hand for the house should we ever lose power. I can see running the wire out the top of a window and putting the panel on the roof. That would give at least some light over sinks, etc. Rain, thanks! Those solar lights are great. Nice and bright and the battery stores enough energy for my needs. I also love my Dutch doors! A nice way to let in light and air but keep critters on whatever side they belong! On the posting question: If the comments have to be approved before they are visible, you can pick through the spam pretty easily. And depending on how "clever" they are, Blogger seems to pick out the definite spam. It is only the ones that seem like they are a comment (until you read them) that lets them slip to the review phase. Wonderful, beautiful, extremely functional structure! I have goat barn envy. so nice to see the continued progress. Everything looks wonderful. TB, thanks! The last time I did the moderation approval thing, I was getting quite a few really vulgar comments, things I didn't want to look at. I did pretty well with anonymous comments, but for some reason had to change that, but I can't remember why. May need to do a change up again. Mama Pea, thanks! The practicality is the result of having to live with problems and inconveniences for such a long time. Not that I minded, I'm just thankful for the chance to have it nicer and easier! Looking good Leigh! You guys have gotten so much done already. Chris, it seems that way! Except that the finishing touches list keeps getting added to, LOL. Paula, it's a relief to finally get this close to the finish line! I love the progress reports, always look forward to more. Mrs. Shoes, hopefully the day is soon coming when I can say, "done!" 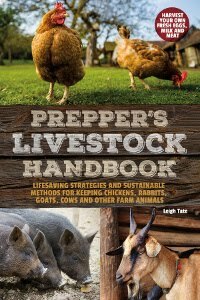 Prepper's Livestock Handbook Giveaway Winner! 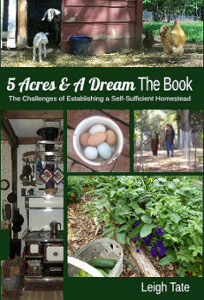 New Book Non-review and Giveaway!